I was honoured to be asked by Pooky Amsterdam to appear on her 1st Question quiz show filmed live in Second Life last Sunday. I was with some great panelists Zya Zavira and Avantgarde Frequency. Both of who are very well respected in their metaverse fields. 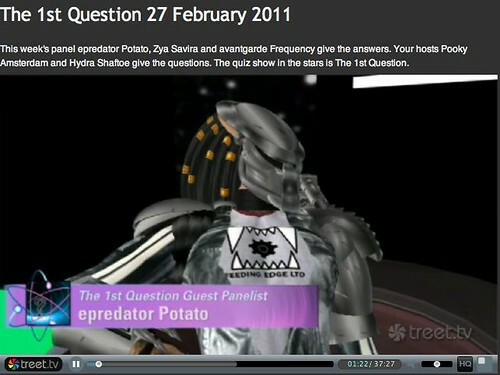 It was a late night as the show is recorded by Treet.TV with a live audience around midnight UK time. However we are such a multi national bunch from Australia to UK and mainland Europer to West coast US that it becomes part of the fun. The show is a set of quick fire questions, some buzzer rounds and some intros and talking by the contestants. It was brilliant fun, though being a competition and relatively techie I felt a certain amount of pressure. It all came out alright in the end. It was great to have an invited audience too as they shout/type out answers and Pooky Amsterdam and Hydra Shaftoe do a great job wrangling us all. There are also live scoreboards and a portion of audience voting as we try and get our panel words we bring along to be the most popular. There is an ad break too. Not your usual advert though as this one shows an incredibly important use of virtual worlds. Fearless Nation provide Post Traumatic Stress Disorder support in Second Life. The potential for anonymous counselling as well as directed role play to help people come to terms with real experiences is incredible powerful. As I am recording an Opensim virtual world piece for the show very soon it was great to be part of such a professional and fun operation for the show. Tomorrow its back to the BBC for more “traditional” TV not that @Cstuffc is traditional ! You can’t lose with that sense of humor! It was GREAT to have you on the show – Thanks again!